Hardcover, 9.5 x 11 in. / 240 pgs / 120 color / 88 bw. First monograph in more than 25 years on a titan of the Russian Avant-Garde. Text by Simon Baier, Gian Casper Bott, Dimitrij Dimakov, Jürgen Harten, Nathalie Leleu, Maria Lipatova, Anatolij Strigalev, Anna Szech, David Walsh, Roland Wetzel. Painter, architect, engineer, set designer, father to the Russian Constructivist movement, inventor of the “counter-relief” and author of one of modernism’s greatest icons, the “Monument to the Third International,” Vladimir Tatlin blazed an incredible trail of innovation through the glory years of the Soviet avant-garde. Nevertheless, “Not the old, not the new, but the necessary” was his motto; having spent his early years as an icon painter, Tatlin eschewed the modernist disavowal of heritage in favor of a research-based attitude to materials and genres. His “counter-relief” sculptures, made of wood, cardboard, metal and wire, were foundational works for Rodchenko and the Constructivists, and their influence can be seen today in the works of creators as various as Zaha Hadid and Richard Tuttle. But it is his “Monument to the Third International,” often called simply “Tatlin’s Tower,” that has grasped the imaginations of artists, architects and writers down the generations. 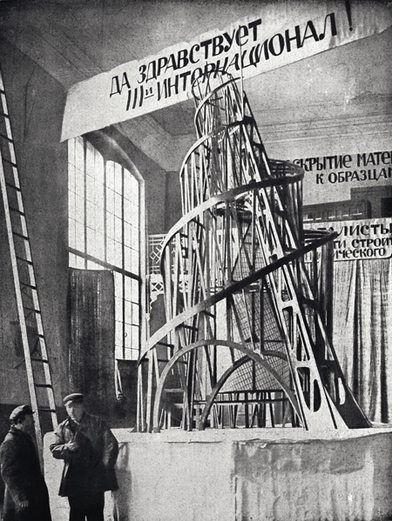 Though it was never built, “Tatlin’s Tower” endures as a promethean image of utopian heroism and Soviet optimism, as does the artist himself, who applied his energies so broadly, without loss of integrity or focus. 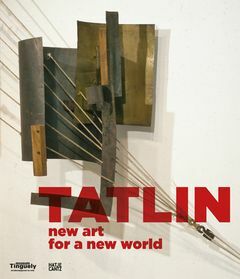 With 120 color illustrations and a wealth of archival photos, this volume offers the first English-language overview of Tatlin’s diverse achievements in more than 25 years. Published for a landmark exhibition at the Museum Tinguely in Basel, it examines every facet of his output, from his early Cubist-influenced paintings to the counter-reliefs, the “Tower,” prints, set and costume designs and aeronautic researches, and constitutes an essential portrait of the ambitions of Soviet modernism. 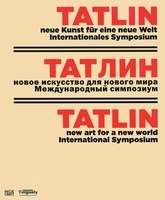 Featured image is reproduced from Tatlin: New Art for a New World. No artist extrapolated abstraction further beyond the canvas than Vladimir Tatlin, on whom Hatje Cantz is publishing the first English-language monograph in 25 years. Tatlin is the Leonardo da Vinci of the Russian avant-garde: an artist-technician who seemed to approach art from some alien vantage point, launching his ideas into the culture without ever worrying whether he was making 'art' or not. His two most famous innovations are the Counterreliefs, the foundational works of the Constructivist movement; and the Monument to the Third International, the defining icon of the Soviet avant-garde. Tatlin's art proceeded through phases so discrete and so complete that it neatly converts itself into five bodies of work around which this book is structured: the early paintings, which date from about 1911 to 1916; the Counterreliefs, dating from 1913 to 1916; The Monument to the Third International, designed in 1920; the Letatlin glider, developed from the late 20s into the early 30s; and the theater designs of his last two decades. Like Andrea Zittel today, Tatlin also sought to reinvent all the components of the new life-from plates, stoves and clothes to furniture and transportation-but of all his works, it's the Monument to the Third International, known as Tatlin's Tower, that everyone recognizes. Had it proved buildable, Tatlin's Tower would've been an Eighth Wonder of the World. Drawing on the structural innovations of the Eiffel Tower, and intended to eclipse it in height, it also mimicked more mythic structures like the Tower of Babel, while challenging all architectural conventions of stability and verticality. Its twinned, upward-spiraling ramps allegorized the Marxist dialectic of history, and its open structure housed three huge rotating chambers for the International: a cube, which would complete a rotation once a year; a pyramid, which rotated once a month; a cylinder, rotating once a day; and a hemisphere for radio equipment at the summit. Tatlin's Tower is effectively a gigantic Communist cosmic clock, in which the actions of politicians are related to, and regulated by, the movements of the sun, the earth and the moon. What greater vision of political responsibility could one wish for? Had it proved buildable, Tatlin's Tower would've been an Eighth Wonder of the World. Now available: the first English-language overview of the pioneering Russian artist, inventor, architect, engineer, designer and avant garde hero Vladimir Tatlin’s work in more than 25 years. Below is a selection of images from the book, followed by the closing passage of Gian Casper Bott's introductory essay, reproduced from Tatlin: New Art for a New World. FORMAT: Hbk, 9.5 x 11 in. / 240 pgs / 120 color / 88 b&w.